This week’s eLearning Heroes’ Challenge on the Articulate Forum (Challenge #47, for those of you who are counting) was to create a quick sample of a call center module. After all, sooner or later most customers have a need for some form of call center training. Thanks, moderator David Anderson, for another great challenge! Since I believe that people learn best when they’re enjoying themselves, I decided to take a humorous route. 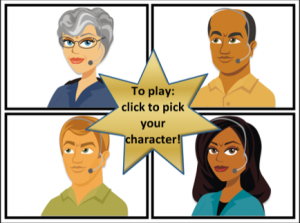 I chose to leverage the nifty avatar characters that come packaged with Articulate Storyline (each character has some images on headset; invaluable for call center trainings–and something missing from their photo character images). And since I was going for a spirit of fun, I chose to use a great set of comic book layout templates that are also available to download from the Articulate Forum. The result is brief–it’s only a sample, after all–but packs in four different scenarios and a whole bunch of good advice for the call center trainee. For a real training, lots of things could be expanded–for example, the feedback could be customized to each scenario. I could add a badge or point system based on the learner’s performance. Sound effects could heighten the experience. Background colors and settings could add another layer. You get the idea. Here I present only the all-important opening interaction with the call center rep and the customer, but for a real project I would build out a longer interaction, branching with each question with varying customer responses, based on how well the call center trainee handles the customer. And of course, the comic book approach is just one of many–but it would resonate particularly well with a population that enjoys comics and graphic novels. If you have a couple of minutes to spare, check out my new sample. It may give you some good ideas. And it’ll almost certainly give you a chuckle. You can click here to view all my eLearning samples, or click the image to launch just this one demo. I’ve been finding a lot of good deals on the iPad Insight / Stack Social site lately. If you’re looking for high-quality graphics that are free for both personal and commercial use, check out their latest freebie deal. You do have to register on their site (also free) and share the link or follow them to download the assets, but I have to say the large selection is surprisingly high quality, and a lot of elements could be handy in eLearning! 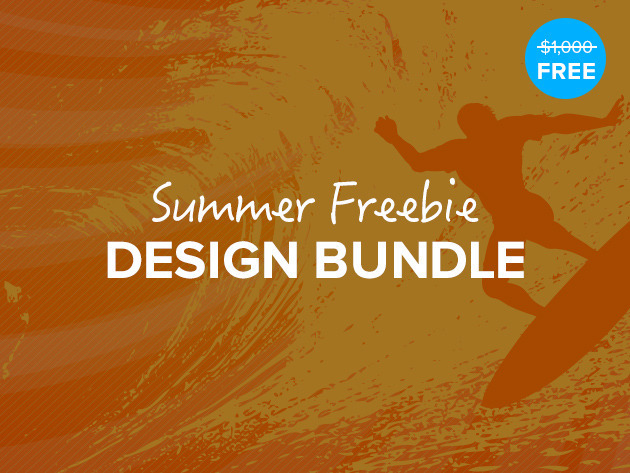 To check out the Summer Freebie Design Bundle, click here. NOTE: This offer is available only through July 15th! Okay, I need some input from you folks: I’m working on my next quarterly newsletter. I see from my MailChimp report that a decent number of you are opening my newsletters, which is great, as I do put a lot of work into each issue. Links don’t seem to be of much interest to my readers, however, which is surprising as I think I’m sharing some pretty cool free tools and info. So let me hear from you: what topics are of most interest to you, for upcoming blog posts as well as newsletters? Some possible topics: Articulate Storyline, Presentation Skills, Gamification, Voiceovers, eLearning Script Writing, Needs Analysis, Making eLearning Content More Engaging, Scenario-based Training, Ideas for Mobile Learning, or…? 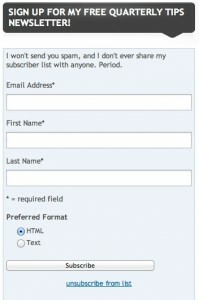 And let me know what you’ve thought of prior newsletters–more of something? Less of something? I genuinely appreciate all constructive feedback–my goal is to post content that will be genuinely helpful to you! Let me know your thoughts. New Instructional Video on Creating SMARTER Learning Objectives! I’ve had such good feedback on my 2013 blog post about creating SMARTER learning objectives that I’ve created a podcast version of it, and also a brief instructional video, which you can now launch from my site’s eLearning Samples page. Have a look or a listen, and let me know what you think! Repurposing my blog post to audio and audio/visual delivery methods is a good example of how you can deliver the same content in different ways, and reach different segments of your own target audience! If you’d like to read the original blog post or listen to the podcast, click here. If you’d like to view the instructional video or download it to your iPad, visit my eLearning Samples page, or to launch the SMARTER Learning Objectives video right now, click the image on the right. 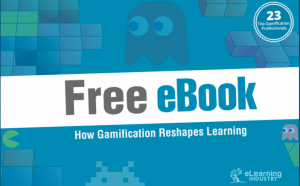 Christopher Pappas of eLearning Industry has put together a free eBook on using Gamification in Learning, with input from a host of gamification folks–including Karl Kapp. To read the eBook online, click the image or click here. Sebastian led an engaging and interactive session, frequently asking us to partner with another attendee to perform one of his activities. The first interaction brought out one of his key points: after a short-term change, we all tend to go right back to what’s comfortable and familiar. Sebastian presented compelling evidence that true change and learning transfer can be better assured by making the learning sessions more manageable in length (he favors a 90-minute maximum), and spaced out over time to allow better reinforcement and retention. He was quick to note that actual length of any particular session really depends on what’s being taught, and that if something less than 90 minutes will do–even better! I noted in chatting with him afterwards that this approach also aligns with a reality we all face today when trying to hold an audience: television and film have moved steadily toward shorter and shorter scenes, and more cross-cutting of them, to keep idle minds engaged. I liked a comparison Sebastian made: ensuring good learning transfer is like practicing good parenting. 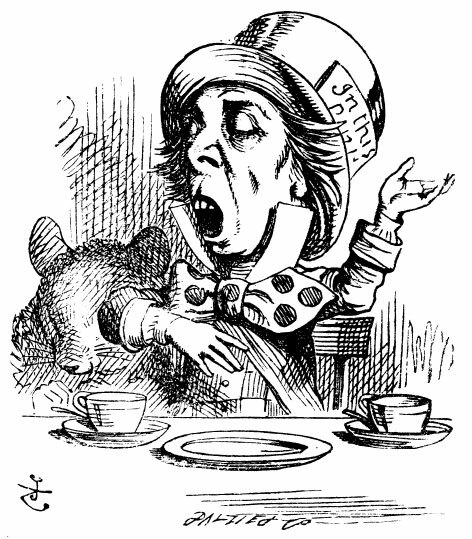 Cramming too much information into someone’s head in a short space of time (for example, a two-day executive boot camp) does not provide lasting learning transfer as effectively as introducing topics in smaller doses over a sustained period of time, allowing the learner time and breathing space to absorb, reflect, and associate. We had another activity and much discussion around what roadblocks might stand in the way of taking a fresh look at learning delivery and migrating to more of a bite-size approach. I offered two that he agreed with readily: organizational tradition (“But we’ve always taught it this way!”–again, really just the desire to cling to the old habits), and fear on the client’s part that all their learning points couldn’t possibly be covered in less time–that something important would be left out. In reality, this comes down to solid knowledge of the content, and thoughtful design–not just instructional design, as Sebastian pointed out, but also program design. To work, bite-size learning needs to be a holistic approach from the start. Other possible roadblocks identified included lack of commitment and ownership, and insufficient understanding of the material’s key learning concepts. “Longer = better” No, it’s just longer. “The event is the hero” No, learning transfer is the hero. “Design for the participant outliers (aka lowest common denominator)” No, design for the context of the application. Engage and stimulate everyone. “We treat people all the same” We should mass customize (as Starbucks has done). “The change isn’t worth the cost.” Focus on value to company and customer satisfaction, not just price. Sebastian also offered examples of how the bite-size approach is also actually more cost-effective to implement. More efficient, less costly–that’s a recipe any learning organization should want to embrace. So how does a learning organization embrace bite-size learning? Sebastian cited the Pareto Principle, which translated into learning terms means essentially that 80% of your transfer comes from 20% of your content. In other words, it comes down to letting go of the “Trivial Many” pieces of information and focusing on the “Vital Few” learning elements instead. After all, as everyone present agreed, quality of learning is not truly measured by time expended. The key is distilling your content down to the Vital Few topics, and figuring out how to spend just enough time on each one. Sebastian also offered this simple model: an ongoing cycle made up of Engage, Participate, and Activate. Here he gave voice to what many of us in the room already believe: for effective transfer to happen, learners need to have a stake in the proceedings from the start, and to be active participants in the learning experience, not just passive sponges or information buckets. As a professional actor, I can tell you this from personal experience onstage: the scripts that most “grab” an audience are not the ones that simply lay everything out and tell the audience what to think and feel. A good script (and good learning) pulls the audience into the event and makes them willing and eager participants. In other words, what comes before and after a learning event is most likely to be where we fail to deliver what the learner needs. Whether you choose to deliver your learning event as “big gulp” or bite-size, that truth remains: we always need to provide our learners with meaningful context for why they are being offered the learning event(s), and support for the new behavior after the event(s). In closing, Sebastian noted that we all need to focus on increasing “opportunity recognition,” leveraging the power of giving learners targeted hints to help them see the opportunity for the solution themselves. We provide them with the tools, a way in, and motivation–and they put it all together for themselves, enriching the experienced and deepening retention. With that focused help from us, the learning transfer success factor increases enormously. Thanks again to Sebastian and to ASTD NY for another excellent, invigorating session. For more about Sebastian and his company, I encourage you to visit the Mind Gym web site. 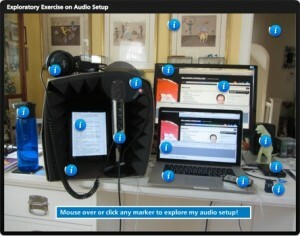 New Articulate Replay Tool is Free For Current Storyline License Holders! If you have a current license for Articulate’s Storyline eLearning development tool, here’s a great bonus: you are now eligible to receive a free, licensed, full version of Articulate’s new presentation tool, Replay! To claim your copy, have your Storyline license number handy, and click here to complete the request form. I just downloaded my free copy, and look forward to checking out the Tutorials and Discussions in their Forum. You can create standalone presentations with Replay, or drop them into your Articulate Storyline or Studio projects. Given the cost of eLearning tools these days, this gesture from Articulate to licensed Storyline users is a delightful surprise. Thanks, Articulate! I hope it’s the start of a trend. And I hope the Adobe Captivate and Presenter teams are watching. Storyline license holders: download your free copy of Replay today! Tom Kuhlmann, VP of Community for Articulate, and David Anderson, Community Manager at Articulate, were at the New York Institute of Technology in NYC on 9/24-25 to teach two one-day classes targeted to folks who are new to eLearning. On the evening of 9/24, Tom also gave a separate talk about where eLearning fits into the whole learning picture today, with a few assists from David. These events were co-sponsored by ASTDNY and STC NY Metro, with support from TrainingPros. There was a modest admission charge for the evening talk, but Tom is always well worth hearing, regardless of your level of expertise. Make sure to involve a representative sampling of the target audience’s team in identifying the topics and presentation plans for the eLearning content. That way, the course is more thoroughly and effectively vetted before it is built, saving everyone time and potential headaches. I would also add that for companies who keep their learning teams small, it’s that much more important to have a well-thought-out archival system in place, to keep a record of what has been created (and agreed to in writing with clients), and ensure that all source files area readily available should the chief eLearning team member be out or leave the company. An audience member asked about consistency of formatting in eLearning, and whether that can become a “trap” that limits creativity and learner enjoyment. Tom opined that organizations tend to get what they’re willing to pay for, unfortunately. And they typically want the same kind of course they have seen in the past–often simply because they haven’t seen anything better. In my own work, I’ve found that creating and sharing a quick mock-up of a few slides to share my vision for the course will help bring clients on board quickly. Of course, budget is always the bottom line. 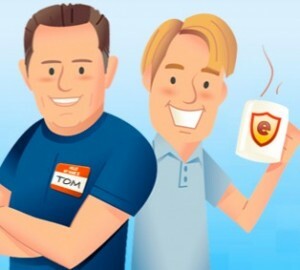 Tom cited Compliance courses as a classic case: we all know that a company typically produces a compliance course only to meet a regulatory requirement, so they don’t want to waste a lot of resources putting it out there. Hence the omnipresence of un-engaging, ineffective compliance training. I couldn’t agree with Tom more that while it’s both important and helpful to create some instructional design templates to ensure a measure of quality and consistency within a course and across multiple courses in a curriculum, it’s also important to give courses their own identity, and to leave room for creativity. I consulted with a great company once that had just invested a good deal of money in an eLearning rapid development platform, but then locked down the content presentation slide by slide in a well-intentioned attempt to ensure instructional design soundness and consistency from one course to another. Their lockdown meant all courses needed to present exactly the same elements in the same order for every course–regardless of topic. It’s still possible to exercise some creativity within such constraints, but courses–and learners–naturally need variety. With regard to the cost and complexity aspects of eLearning, Tom rightly questions a course development model like “level 1-5” because it implies that a course built simply and inexpensively (level 1) is low quality and a course with all the bells & techno-whistles (level 5) is always the best, which is simply not the case. I was glad to hear him reinforce the goal of fitting the learning to the specific audience need. If a simple how-to video is suitable, great. If complex interactivity (like scenarios) is needed, so be it. I would add that both of those examples could be produced inexpensively or expensively; that’s where creativity comes into play again. He also stressed the importance of being part of a strong user community (like Articulate’s eLearning Heroes forum) and noted that non-Articulate users can still benefit from a lot of the discussions and free templates on their forum. I couldn’t agree more. If you’re not already registered there, I would strongly suggest you sign up and begin reaping the benefits of crowdsourced creativity today. You’ll see David on there regularly, answering questions and giving feedback. You should also sign up for Tom’s Rapid eLearning Blog, if you haven’t already; he shares excellent advice and lots of free templates. And the next time Tom is in town, you should make a point of attending and absorbing some of his great tips. SPEAKING OF TIPS: IF YOU HAVEN’T ALREADY SUBSCRIBED TO MY QUARTERLY TIPS NEWSLETTER, NOW IS A GREAT TIME TO DO SO FROM MY HOME PAGE. THE FALL ISSUE IS COMING OUT IN A FEW DAYS, AND IT’S GOING TO BE COLORFUL!